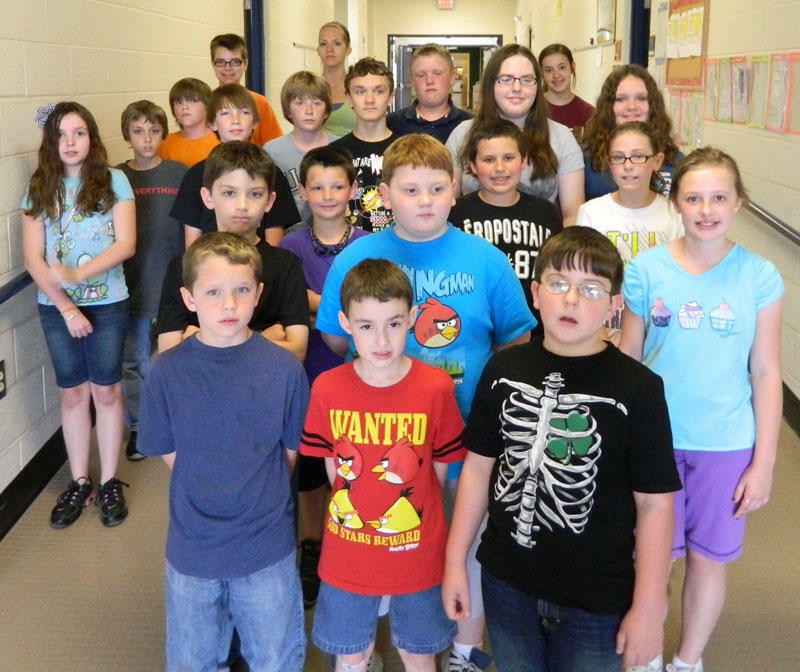 1st row (L-R): Braxten Alexander, Cathan Cecil, Lane Nichols; 2nd row: Clay Fagan, Brent Scott, Lacon Parton; 3rd row: Landon Parton, West Slatton, Lauren Underwood; 4th row: Maisie Hogan, Gavin Duke, Corey Seymour, Caitlin Bowman, Molly Manus; 5th row: Trent Bynum, Collin Stembridge, Justin Winchester; 6th row: Dalton Pitts, Haylee Mooneyham, Katie Hoskins. East Side Elementary School held its annual school science fair on March 13th. Students from many classes presented their very own projects and experiments. During an after-school event, students of all ages had the privilege of participating in a variety of hands-on activities provided by The Discovery Center of Murfreesboro. Many families came to join in the fun. Activities included viewing of projects, fossil identification, microscope investigations, as well as other interesting topics. A special thank you to Bobby Couch and Manchester Physicians Group for providing the award ribbons for class winners as well as the snacks for the event. 1st: Lacon Parton - “Petri Dish Bacteria” discovered which locations in her harbored the most bacteria. 2nd: Clay Fagan - “Which Battery Lasts Longer” tried different brands of batteries to determine durability. 3rd: Brent Scott - “Colored Plants” added food coloring to water to dye flowers. 1st: Lauren Underwood - “Dangerous Dust” simulated how dust can be combustible. 2nd: West Slatton - “Newton’s Third Law” constructed a car that showed how distance is related to force. 3rd: Landon Parton - “Landon’s Foam Cutter” showed how foam could be cut using an electrified piece of wire. 2nd: Maisie Hogan & Victoria Jones - “Hot Ice Cream” created a coating for ice cream to protect it from the heat. 3rd: Gavin Duke & Corey Seymour - “Flying Potatoes” constructed a real working potato gun. 1st: Justin Winchester - “Hydraulics” demonstrated the concept of hydraulics by creating a working robotic arm using medical syringes and water. 2nd: Collin Stembridge and Trenton Bynum - “Hovercraft” built a gliding craft to ride on using a leaf blower motor. 3rd: CK Burnam - “Air Propulsion” constructed a working air boat from the motor of a remote controlled helicopter. 1st: Haylee Mooneyham - “Hay Horse” showed how the different types of hay can affect the blood sugar levels in horses. 2nd: Katie Hoskins - “See the Rainbow” used chromatography skills to separate the different colors used in Skittle dye. 3rd: Dalton Pitts - “Loopty Loops” demonstrated how height affects the potential energy created to make a marble complete loops on a coaster. Congratulations to all winners as well as participants. There were so many amazing experiments and projects!